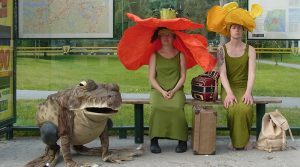 Ingela Ihrman is a Swedish artist and ‘We Thrive’ at Cooper Gallery is her first UK solo exhibition. Ihrman explores the complex relationship between humans and animals or plants in her work. Using a mixture of tactile handicraft, performance art, installation, video and writing, she creates absurd theatrical pieces that are often humorous, showing a loving relationship to lives lived in a variety of habitats that verge on the abject, clumsy and the awkward. Describing her perspective as ethno-biological the artist focuses not on nature itself but on how humans use and perceive it. Enrobing herself in the softly sculpted vestments of plants and animals, Ihrman anthropomorphically adopts both their shape and mind during her performances. The static and the indiscernible come alive, writhing and wriggling awkwardly into blossom or birth. Watching the event unfold, the viewer is made to think about comparisons and connections between what we are and what we are not and of how we understand ourselves through the stories of nature. At the gallery entrance level a large video projection entitled Obstacle is playing. 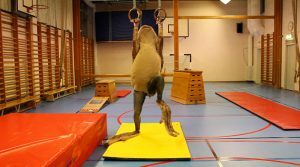 A giant toad is having difficulty negotiating various stations of a gymnasium course. Anyone who has observed a toad in the wild will understand the ridiculous and unwieldy display he is made to undertake as he grapples with such an anomalous environment. Dominating the main exhibition space is an eight metre long sculpture entitled The Giant Hogweed. Hogweeds are intrusive and rampant plants with a sap that can cause serious burns. 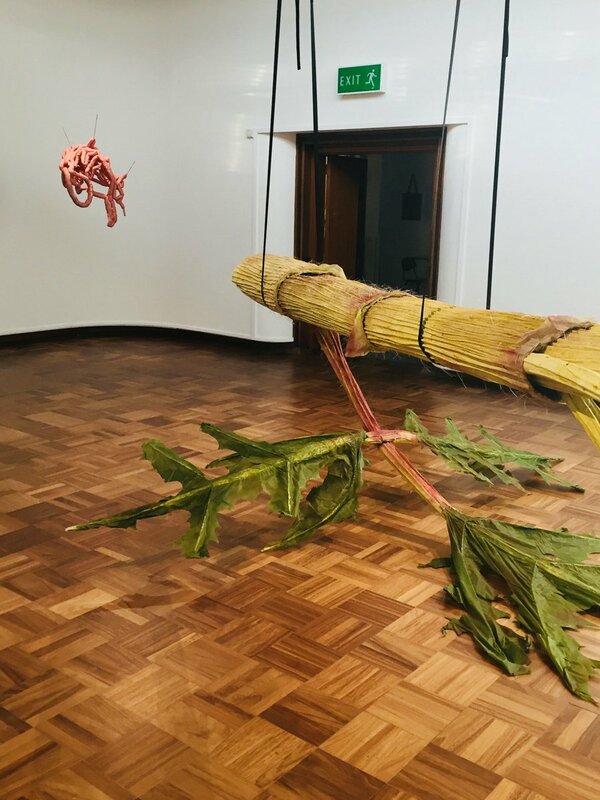 Sprawling in all directions, Ihrman’s weed’s huge bulk is suspended from the ceiling by black nylon straps; however, the plant looks sorrowfully wilted, its pale petals shedding onto the floor below. Closer observation reveals a structure composed of tactile and malleable materials, and a flesh pink hollow interior that belies botanical accuracy, “an attempt to turn the detested plant into a body and to connect hogweeds taking over a landscape with the way love and desire totally overwhelms both body and mind”. The portrayal of this invasive species is thus challenged and transformed into something a bit more abject. This contradictory characteristic is also evident in the opening live performance of The Giant Otter Giving Birth. Spanning twenty minutes, the actions of the mother otter builds up from imperceptibly small movements to the final births of three otter pups. With the audience as witness to the arduous event, they emerge in a candid mess of pink gunge and the mother otter’s final exhaustion postpartum. The latter’s occasional awkward gestures and clumsy actions provoke nervous laughter in spectators, recognition perhaps of the fragility and vulnerability of the reproductive process which, when viewed within the non-natural institution of the gallery, produces a disruptive frission that requires readjustment. Being inside another’s body and journeying into other gory anatomies is a theme also dealt with in the video work Green Paradise, what Jan Lindbland would have seen from inside the anaconda. The artist’s written testament to the naturalist is placed next to the monitor; Ihrman explains that, in the 1970s, Linbland was a very popular Swedish television presenter advocating a life ‘closer to nature’ but he is virtually forgotten today. In the footage screened, Linbland can be seen wrestling a large anaconda in a river. His commitment to nature is palpable and his genuine wonder at nature in all its aspects emerge in the interiorised fiction of Green Paradise. Travelling in other’s interior worlds is further represented through the various writings presented on the foyer table. There is a creative text about listening, a transcribed interview with a philosopher about vegetal life, and a selection of fiction linked by themes of metamorphosis, myth and natural science. Original and playful, Ihrman’s works are carefully and intricately made, serious and important in light of current environmental concerns and increases in extinction rates. The exhibition reinforces the general awareness of outside nature as a force to be respected and reckoned with, and reminds us of the prevailing disconnection of man from the complexity of what are natural processes and behaviours. Yes, that transports me back to the show. We are all connected through vulnerability. We are all a bit ridiculous and more than a bit glorious – through our humility!